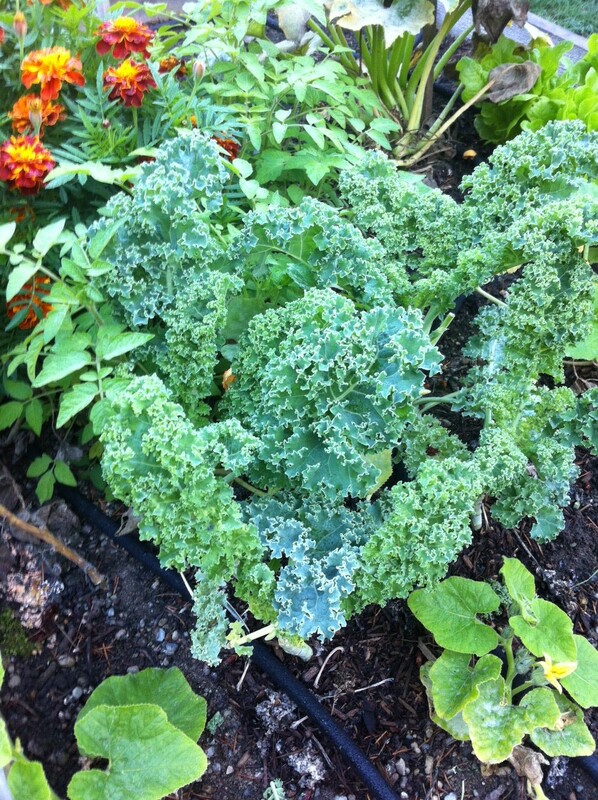 On my way out one morning I noticed the kale in our garden was was especially green and growing quite big. For the rest of the day I had it in my head that I wanted some kale chips. Normally I put a little kale in my vegetable soups, but on this day I just wanted some crispy, salty kale chips. I got home early that afternoon and in the midst of collecting handfuls of kale when one of our neighbors walked by and said hello. She complimented our yard and noted how hard we seemed to be working on it. To be honest any improvements to the outside of our home has to go to Craig. He mows it, sweeps it (although I did do it once), plants the flowers and veggies (although I eat the veggies), and he’s even the person who picks up Molly’s poop (although I have done it a few times). I thanked her, but commented that it still needs a lot of work. Craig has big dreams for our yard. Thanks, Craig. Beautiful fresh kale from the garden. Afterward I brought in the kale and made a large tray of kale chips I decided to roast some of our carrots too. Craig spent a good chunk of the afternoon washing and peeling them so I figured I better eat them. I like this way of eating. Picking the food right out of our garden and making a snack or meal. Mostly snacks for now, but hopefully one day full meals. It isn’t easy. I mean there’s the whole planting and growing portion, but then you have to pick the food, clean it and cook it. A lot of work really. Sometimes it’s just a whole lot easier to buy the carrots already picked and cleaned at the grocery story. Heck, most stores even have packaged kale chips! No heating required. But it’s better this way. I think the food tastes better. We’ve learned a lot this planting season. We’ve had a bunch of failures when it comes to growing our own food, but we’ve learned from it. Next year will be better. I just know it. Directions: There’s a secret to kale chips. They need to be dry. That’s it. So wash them and use a paper towel to ensure they are completely dry. Separate them from the stem and lightly massage them with olive oil, salt and some garlic seasoning. Spread out on a pan and bake at 300 degrees for 15-25 minutes. I like to check on them every 8 minutes and move them around to keep them from bunching. Directions: Preheat oven to 425 degrees. Mix carrots with olive oil (just enough to coat) sprinkle salt and pepper and then mix in vinegar. You want more vinegar than olive oil. I cooked my carrots in a glass dish mostly covered with tin foil. I left some openings on the end for heat to escape. Cook for 20 to 25 minutes or until a fork can poke through carrots. We’ve just started trying out kale chips, but with mixed results. We didn’t think to completely dry the kale first; thanks for the tip!